Opt for a black long sleeve blouse and a silver pleated midi skirt to don a stylish look. Add silver leather pumps to this ensemble and off you go looking smashing. Opt for a navy chiffon midi dress to assemble an interesting and current laid-back ensemble. If you're not sure how to finish off, round off with a pair of Sam Edelman Hazel Pointy Toe Pump. Why not pair a white tweed jacket with blue ripped skinny jeans? These items are totally functional and look wonderful when teamed together. 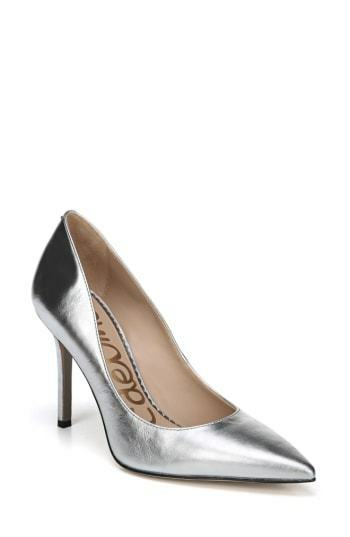 You could perhaps get a bit experimental on the shoe front and introduce Sam Edelman silver leather pumps to the mix. A black leather biker jacket and blue ripped boyfriend jeans married together are such a dreamy getup for fashionistas who appreciate cool chic styles. Go ahead and grab a pair of Sam Edelman Hazel Pointy Toe Pump from Nordstrom for a sense of refinement. A white and pink floral crew-neck sweater and red skinny pants are absolute must-haves if you're figuring out a casual closet that holds to the highest fashion standards. Let your styling chops really shine by rounding off this outfit with a pair of Sam Edelman Hazel Pointy Toe Pump. If you're on the lookout for a casual yet totally stylish ensemble, consider pairing a grey blazer with white skinny jeans. Both garments are totally comfy and will look fabulous together. Polish off the ensemble with Sam Edelman hazel pointy toe pump. Rock a gold fit and flare dress to look absolutely phenomenal. Let your outfit coordination skills truly shine by complementing this ensemble with Sam Edelman Hazel Pointy Toe Pump. No matter where the day takes you, you can rely on this relaxed casual pairing of a white crochet midi dress. Complement this outfit with Sam Edelman Hazel Pointy Toe Pump from Nordstrom for extra fashion points. Channel your inner fashionista and opt for a purple sheath dress. A pair of Sam Edelman Hazel Pointy Toe Pump complements this ensemble quite well.